Łódź ([wut͡ɕ] ( listen) Yiddish: לאדזש‎, Lodzh) is the third-lairgest ceety in Poland. Locatit in the central pairt o the kintra, it haed a population of 742,387 in December 2009. 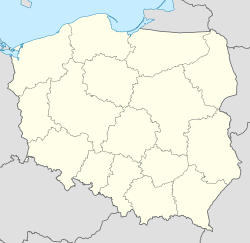 It is the caipital o Łódź Voivodeship, an is approximately 135 kilometres (84 mi) sooth-wast o Warsaw. The ceety's coat o airms is an example o cantin: depictin a boat, it alludes tae the ceety's name which translates literally as "boat". Wikimedia Commons haes media relatit tae Łódź. This Poland-relatit airticle is a stub. Ye can help Wikipaedia bi expandin it. This page wis last eeditit on 21 Februar 2018, at 21:35.